The UK riding scene is vast. Sub-cultures within niches within categories from time trialling, hill climbing, crit racing, road racing, sportive riding . . . the list goes on. Keen to explore a few of these communities and to find my feet within the British cycling fraternity I was quick to reply to the invite from a good friend who had also traded swimming trunks for lycra during the years after university for a long day out up the East of England as part of the UK Audax scene. From what I gathered over the coming days, Audax UK or AUK resembled the cycling equivalent of a local village scout group, only instead of catering for the 6-16 age group its main target audience appeared to be anywhere from 25-85 or basically anyone and everyone that preferred weekends of two-wheeled adventure and mischief on British roads to the realities of domestic life. In true scouting fashion we gathered in the local church hall the night before the event, pumped up the air beds, unfurled sleeping bags and preceded to get the worst night’s sleep imaginable in preparation for the 6 a.m roll out the following day. Between the raucous rumbling of snores, the toilet habits of the halls thirty or so guests and the man in the opposite corner who seemed to change position every half an hour on the world’s most obnoxious inflatable lilo, I must have slept about three hours before morning rituals took over and the mothers union coffee and cake supplies were quickly raided and depleted. Compared to the usual carnival and start line antics I had observed racing in China, the grand-depart was a much more British affair. The race organiser arrived at the local pay-and-display clearly not impressed with the early start, muttered a few words about a possible diversion on the B1040 due to planned work by Cambridgeshire CC Highways and off we went, a trail of flashing and bobbing lights into the cold blue dawn and low lying fog of the fens. Wisdom harvested from the hard graft experience of established riders formalises itself within cycling communities as unquestionable ‘etiquette’, this I’ve learnt over the years constitutes about 80% of the sport, the other 20% being the fitness required to turn pedals relatively efficiently. That being said however if a rider without prior knowledge of basic peloton decency has the power to bulldoze through a headwind whilst dragging 8 men for 50 km the rules are quickly forgotten. In audaxing I quickly had to recalibrate my reference points for good and bad form as I sat behind the wind shield of an exposed mid-drift and pair of translucent lycra hot pants for far too long. The route itself was fairly uninspiring. A 600 km out and back to a motorway service station on the M62 that took in the flat lands and characterless agricultural lands of Lincolnshire. 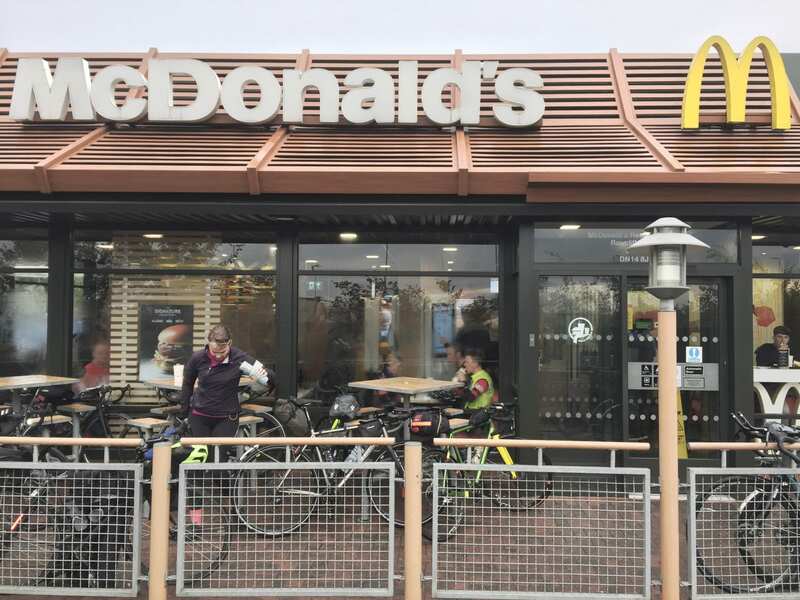 The half way point was marked by the welcome sign of Ronald McDonalds golden arches and I think even the most nutritionally conscious within our party were happy to be tucking into Big Macs and triple McCoffees after 300 km and 12 hours of riding. Another five hours of saddle time and a few sausage roll stops later our motivation waned and we collectively began scouting the roadsides for suitable bivvy spots. 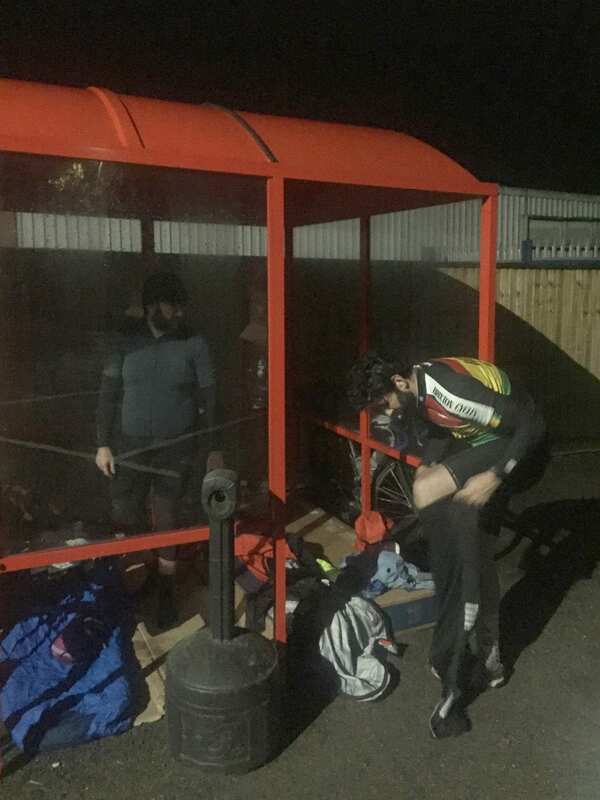 After finding a number of bus shelters that seemed purpose built for the event already occupied by weary cyclists we took a left into an industrial estate finding a Perspex bike shed / smoking hut that perfectly suited our needs, sheltering us from the incessant drizzle that had been gnawing at our morale since nightfall. A mattress was sourced in the form of packaging for a large screen tv from a nearby biffa bin, cardboard was unfolded and placed atop and a bin bag of paper shreddings made for an excellent pillow. Two hours passed until the cold crept in and our midnight fast food feast made answering natures call a matter of urgency. Self-satisfaction of remembering a spare pair of socks quickly dissipated under the grim realisation that I’d left my bike shoes out in the rain. We were quickly on our way, and soon began seeing other headlights on the road. Tales of overnight bivvies and romantic barn stays with hay bales for blankets were traded over bad coffee as we soon began talking about the kms to go in psychologically manageable amounts. Headphones in and our most upbeat playlists called upon we were soon rolling back to where it had all started 30 hours previous, beaming like the boy scouts we were with one more badge to sew onto our lapels. Josh got into cycling during three years working abroad as an architect in China, first to avoid the morning rush hour then later to start exploring the country outside of city walls. The obsession spiralled and the mileage increased. 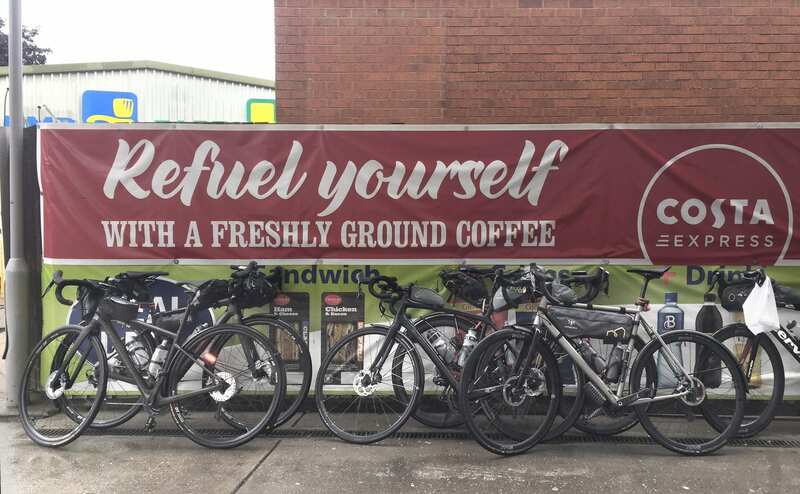 After a season pinning numbers on for ‘Roval Racing’, a competitive bike team based in Shanghai, Josh returned to his native UK and is beginning to find his feet within the world of endurance riding.